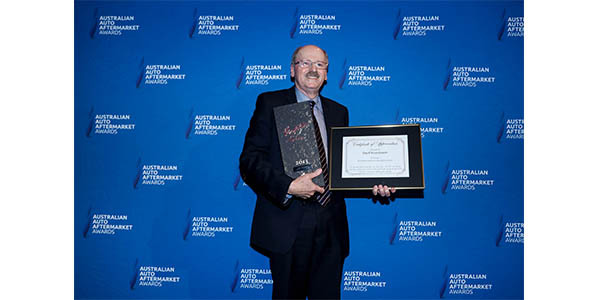 One of the major highlights of the 2019 Australian Auto Aftermarket Expo was the staging of the Australian Auto Aftermarket Excellence Awards at Melbourne’s Crown Palladium on the evening of Thursday, April 4. A total of 750 guests attended awards gala that saw automotive aftermarket industry excellence recognized, along with the honoring of a number of outstanding individuals, both through the Outstanding Service to Industry award along with inductions into the AAAA Hall of Fame. “The AAAA warmly congratulates all award winners along with all of the companies and individuals who made submissions for these highly coveted accolades. There is no doubt that the industry knows no boundaries when it comes to manufacturing and marketing excellence as these awards have clearly recognized,” AAAA Chief Executive Officer Stuart Charity stated. “Our Hall of Fame and Outstanding Service to Industry inductees all richly deserve this recognition for their remarkable contribution to our industry’s growth over the decades,” Charity added. The 2019 Australian Auto Aftermarket Excellence Awards gala dinner was presented by Platinum sponsor Burson Auto Parts, Gold sponsor Dayco Australia, Silver sponsor The Auto Agency and Bronze sponsor ZF Aftermarket, with the support of many more important industry members. Several surprises were revealed during this highly entertaining evening that marked the first day of the 2019 Australian Auto Aftermarket Expo. Gold – Fulcrum Suspensions; Silver – Disc Brakes Australia; Bronze – Redarc Electronics. Over $10 million Turnover Category: Gold – Nulon Products Australia for Project XY; Silver – Gates Australia for their Gates Online Automotive Catalogue; Bronze – Redranger for Nolathane. Commencing his career at Girlock in 1973, then moving to the Borg Warner Group in 1976, Rosenbaum rose to the position of national sales and marketing manager prior to the Borg Warner sale to BTR. In 2000, BTR sold its transmission business to Motospecs marking the beginning of Rosenbaum’s 19-year tenure with the company. Rosenbaum served on the AAAA National Council for a record 21 years, from 1989 through to 2010. His many activities included chairmanship of the Re-manufacturing Committee, honorary secretary and serving on a number of special events sub-committees. In recognition of his outstanding contribution to the aftermarket industry, Rosenbaum was inducted into the AAAA Hall of Fame in 2003 and won the AAAA Outstanding Service to Industry Award in 2011. After a successful 46-year career in the automotive industry, Rosenbaum announced his retirement effective from August this year. Fraser has more than 35 years of experience in the automotive industry and is CEO, Automotive of Capricorn Society. He also was a former associate director and general manager, automotive of ASX listed Coventry Group Ltd., and was responsible for the sales, marketing and administration of the group’s automotive businesses. Aside from a short period out of the industry in 2005/06, Fraser was a member of the AAAA National Council for 16 years, first joining in 2001. He held the role of vice president for three years and was president from 2010 to 2012. Fraser is a Fellow of the Australian Institute of Company Directors and also is a Fellow of the Australian Institute of Management. In 2017, he completed the Harvard Business School’s Advanced Management Program. Fraser takes on the role of Capricorn Group CEO on July 1. After becoming one of the first technicians in Australia and New Zealand to be awarded the esteemed Bosch Diagnostic Technician Certification and attending his first Australian Automotive Aftermarket Expo several years ago, Davis built his professional network, forging the relationships that have evolved his award-winning start-up company Autoexpert into what is now known as Mechanic.com.au – The Home of Australia’s Mechanic. His goal is to connect the automotive service and repair industry in a meaningful and wholesome way, to harness the many benefits of working together and to amplify that on a national level, facilitated by technology. Donovan is the first-ever workshop owner to win this prestigious award. He is the director and owner of Allautos Advanced Tuning, a three-decade, family owned mechanical repair business that he runs with his wife Sandy and son Samuel in the Brisbane Suburb of Geebung. In a career spanning 48 years, Donovan has dedicated an enormous amount of time and effort to a huge number of different organizations and causes. He is driven by his strong desire to see the auto industry unite and he believes in the need for continued training and increased collaboration to help lift the entire standard of the industry. Donovan is an outstanding individual who stands out from the crowd due to his 100 percent commitment to our industry. By the time Blanchard was 11 years old he could already fully service a vehicle himself. This technical knowledge of motor vehicles has given him an advantage throughout his career, often giving customers and suppliers’ advice that has helped set his business apart from the rest. John was the first person to import aftermarket air conditioning systems to Australia in the late 1970s under the Cooldrive banner. A well-respected leader within his business and the entire industry, Blanchard has always taken a keen interest in every aspect of the day-to-day running of his company. Blanchard is well-known for his meticulous attention to detail and incredibly high level of organization. You will often see Blanchard, at 85 years of age, spending time with Cooldrive staff passing on his wealth of technical knowledge so they can better assist their customers wherever possible. Pattinson has been in the automotive industry since 1971 in both the Original Equipment and Aftermarket channels. He joined the AAAA National Council in 2006 and served for a total of 12 years, including three years as vice president and held the role of president from 2012 to 2015. Some of the highlights of the AAAA during his time on council include purchasing its own head office, launching the Choice of Repairer campaign, securing funding for the Auto Innovation Lab and overseeing a tripling of the size of the AAAA membership and a ten-fold increase in the AAAA’s financial reserves. Today, Pattinson is the CEO of the GUD Automotive Division, which is the automotive arm of GUD Holdings Limited, a publicly listed Australian company. Pattinson is a strong advocate for promoting and improving the Australian automotive industry and possesses vast knowledge and experience in all facets of the industry from manufacturing, importing, distribution, wholesaling, retailing and brand management.